Find a vacation home to rent in Pieve Santo Stefano from our list of vacation rental properties. Campaya has over 5 vacation homes available in Pieve Santo Stefano, which give you the possibility to locate a unique accommodation in Pieve Santo Stefano which completes your check-list in search for the perfect self catering vacation apartments in Pieve Santo Stefano or vacation villas in Pieve Santo Stefano. This striking holiday home is in fact a beautifully restored medieval watch tower. For individualists! This generous country cottage is a tastefully decorated summer residence of a Florentine family and offers, besides every imaginable comfort, plenty of "atmosphere". 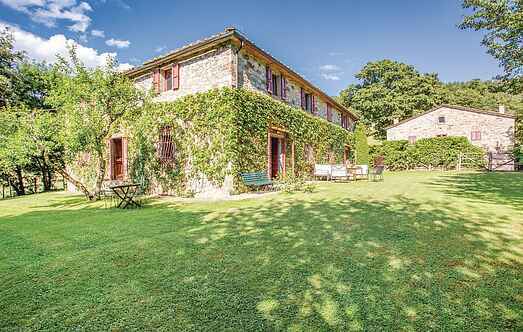 Tastefully restored stone house on the southern slopes of the Apennines. Rustic style furniture, large eat-in kitchen with gallery, outdoor stairs to the lower living area. At 700 m a.s.l, at the southern slopes of the Apennines and about 5 km from Pieve S.
This impressive holiday home is located 10 km from Sansepolcro, in the mountains of the Alta Valle del Tevere.